Is Nokia Ready To Get Cozy With Windows Phone 7? Home > Microsoft > Is Nokia Ready To Get Cozy With Windows Phone 7? There have been rumors for quite some time regarding Nokia and a move to Windows Phone 7 or Android. Those rumors are heating up now with Nokia’s platform looking non-existent in today’s smartphone wars. The latest rumor has Nokia partnering with Microsoft on February 11th, essentially making a move to the Windows Phone 7 platform. 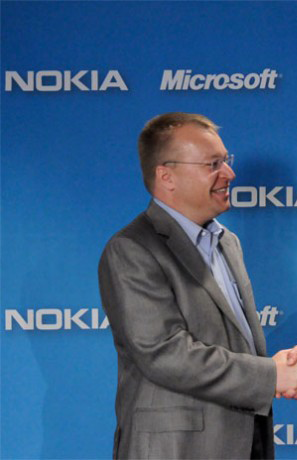 Stephen Elop, the current CEO of Nokia, is a former employee of Microsoft. A big speech to investors is planned for February 11th in London. Microsoft insider Mary Jo Foley says it’s not happening. Where do side? The idea of a Nokia smartphone powered by Windows Phone 7 get you excited? It would be great to see the great technology and history and quality that we have grown to love from Nokia on a OS platform that will offer productivity, gaming, apps and be as versatile as any other OS. It would also be nice to see a company go a path less taken and take advantage of the MS OS infancy and not dilute itself like every one else in Android fever. It would also be nice to see not only WP7 OS flavors but also embedded OS from MS for lower priced handsets and also tablets. By offering three versions of the same flavor they can reach out to more customers while still offering one platform unity. Hope it works out, it would be great for both! I would love to get my hands on a Nokia WP7! Now this is the way to get the MWC started.